From first grade through junior high, twelve-year-old Kevin and his best friend, Ben, were inseparable. But when Kevin divulged his biggest secret, Ben froze him out. The pint-size cold war lasted two years—until they went head-to-head for student council president. Team Ben’s smear campaign began. The school took sides. And Kevin decided to run with it. Kevin Allison’s Two Henrys is part of This Can’t Be Happening, a collection of four true stories about making the best of a worst-case scenario curated by Kevin Allison, creator of the hit true storytelling podcast RISK! Outrageous, alarming, triumphant, and sometimes embarrassing, these fearless confessionals can be read, or listened to, in one what-on-earth-would-I-do? sitting. Switch back and forth between reading the Kindle book and listening to the Audible narration. Add narration for a reduced price of $0.00 after you buy the Kindle book. 5.0 out of 5 starsI Want To Hug Kindergarten Kevin! Kevin Allison’s stories always go straight to my heart, no matter how far-fetched or brutally honest. 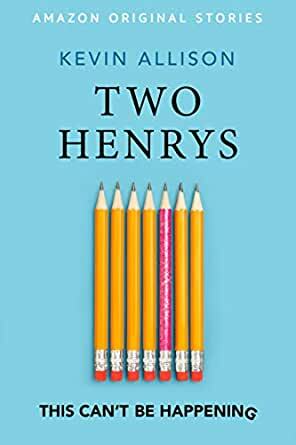 Kevin’s mastery of storytelling shines in “The Two Henry’s” as he seemlessly leads the reader into the mind of his inner little boy, who, whether he knew it or not, was very brave and highly intuitive. Bravo! As always, I am left wanting more of Kevin’s stories! I liked the book, but liked Kevin and Ben more. I guess I related to the story, huh? Thanks for a good read. This story was shorter than I expected it to be, but I really enjoyed reading it. It was funny, heartwarming, then heartbreaking, then sweet and heartwarming again. I recommend it. Thank you Kevin (or, should I say, Henry)! PS: Whatever became of Ben? So well written and fast paces. It's just that it left me wanting to know more. If there's a suite that would be great!